Snehal Bhatkar – The world is too small? or Is it? Welcome to June, 2018 edition of Carnival of Blogs on Golden Era of Hindi Film Music. The month of June is the month of anniversary of one of our most frequently visited blogs – Songs of Yore. SoY has completed 8 years this June. True to the spirit and now the tradition, the 8th Anniversary post has presented songs that are not only not heard of but have very interesting stories to go along with. Suraiya: The Last Nightingale of Bollywood – While paying the tribute to her on 89th birthday (15th June, 1929), D P Rangan has traced her biography and presented 20 of her less-heard songs. Shyama- Sun Sun Sun Zalima – An early song where Shyama first made an impact is the second version of the main love duet, ‘Tu Mera Chand Main Teri Chandni’, from A.R. Kardar’s Dillagi (1949) starring Suraiya and Shyam. The original version was filmed on the stars, but this version on Shyama voiced by Geeta Dutt is less known. Remembering Legendary Composer Vasant Desai, born as Atmaram Desai on 9th June 1912, known popularly by his nickname, Vasant Desai. His compositions in Hindi and Marathi films had their share of popularity. He has composed background scores for very unique films, like Yaadein (1964) and Achanak (1974), over and above many others like Zalzala (1952), Ferry (1954), Kabhi Andhera Kabhi Uajala (1958). Snehal Bhatkar – A Tribute – was born as Vasudev Bhatkar on 17th July 1919, and passed away on 29th May, 2007 in Mumbai. Rajendra Krishan-The Lyricist who gave us many Immortal Songs – born on June 6, 1919 to Parvati and Jagannath Duggal in Jalalpur Jattan of Gujarat district (now in Pakistan), Rajendra Krishna was an equal among the great contemporary stalwarts. He gave lyrics to a wide variety of songs, ranging from Ghazals to Bhajans, Geets to Nazms with great flair. His songs are simple, inventive and full of meaning. May, 2018 episode of Fading Memories, Unforgettable Songs is dedicated to Dattaram, wherein we had remembered his songs from Ab Dilli Door Nahi, Paravarish, Qaide No. 911 and Santan. For Dev Anand,flirtation was an innocent pastime – Author has picked up these narratives from Dev Anand’s autobiography Romancing with Life before presenting 10 Romantic Songs of Dev Ananad. How SD Burman missed out on a Filmfare Award for his greatest soundtrack ‘Guide’ – Anirudha Bhattacharjee & Balaji Vittal – Edited excerpts from a new biography, S.D. 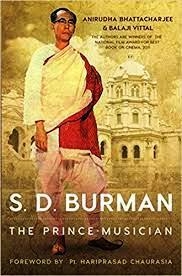 Burman: The Prince-Musician, of the celebrated music composer reveal the background maneuvering that denied ‘Guide’ its glory. ‘Every Song Has a Story’: In Conversation with Anirudha Bhattacharjee and Balaji Vittal with Antara Nanda Mondal on the occasion of S.D. Burman: The Prince-Musician. The writer duo talk about how their adoration for music maestros SD Burman and RD Burman, their love for music and their curiosity behind the making of those evergreen songs led them to write biographies of their idols – their challenges, discoveries, the journey and more. The Greats: Nargis and The Many Moods of Nargis are the two key posts penned to document the author’s new found adoration of Nargis. Additionally, there are reviews of her films Lajwanti (1958), Raat aur Din (1967) and Barsaat (1949) till now in June, 2018. Bombay in songs which are unheard and un-posted. ‘Bandits, Indian Style’ recalls the songs from movies that revolved around the Indian style dacoits. Each of the film mentioned herein also has documented the name of the actor who played the role of the dacoit too. The Popularity Of Bollywood Songs is captured here in one song from each decade, starting with ‘30s. Romantic, sad, a stage performance, a Mujra, and club Songs of ‘Dil Lagana’ in nearly all sorts of songs that have been presented in this post. I Compose I Sing – ‘Aaj jaane ki zid na karo amazes not only for its unbeatably high number of people rendering it, but also in the fact that every single person who has sung it has stuck to the same original tune made in 1973.’ On that note of composition of the song, the article goes on to list a few instances of artists who sang for themselves. Ten of my favourite dream sequence songs is a follow up post to the last month’s Ten of my favourite Khwaab/Sapna songs. And then we have Ten of my favourite ‘dreamt’ songs are the songs that are actually dreamt. People fall asleep and, in their dreams, a song plays out. Actions Speak Louder Than Words – The idea of charming the snakes is Indian. The modus operandi of this process to charm involves swaying the snake repeatedly to hypnotize the creature. If that works, the phrase “actions speak louder than words” will find endorsement. The instrument used for the job is called been, which is a generic name, the specific one being pungi. Kalyanji (Anandji) Shah decided to play an early French synthesizer called clavioline to simulate the pungi’s sounds, initially in Naag Panchmi (1953, Music: Chitragupt, Lyrics: G S Nepali). The key song here was the Asha Bhosle-rendered “O Naag Kaheen Ja Basiyo Re”. Hindi songs with Sapera (Been) Dhun – The first Sapera based Hindi films was ‘Sapera’ in 1939. We have not been able to get a song from it with the Been dhun. The dancing girl, the king and the nation begins with a narrative review of Amrapali (1966) and Vyjayantimala’s enactment of eponymous heroine who is a performer, dancing for the pleasure of others as well as for self-expression. The post then goes on to introduce Ruth Vanita’s book Dancing with Nation. The book examines the cultural importance of the Hindi-film courtesan (a word used to cover such designations as nartaki, devdasi and tawaif – all terms with subtle differences in meaning, which have experienced semantic shifts over time). We have commenced Micro View of Best songs of 1947: And the winners are? with male solo songs of Other Male Singers and concluded micro review of male solo songs with MY Top Male Solo Songs. We have then continued with micro view of female solo songs, wherein till now we have covered solo songs of Suraiya and Geeta Roy. In our tradition of ending our post with article on Mohammad Rafi or a topical song of his, I have picked up songs that basically have link with the topics discussed in the present post. Most of the Hindi Film songs fans should not find it difficult to remember that composer of one of Mubarak Begum’s iconic Song Kabhi Tanhaiyon Mein…. Hamari Yaad Aayegi is Snehal Bhatkar. Snehal Bhatkar (original name Vasudev Gangaram Bhatkar, a.k.a. Vasudev, B. Vasudev, Snehal and V G Bhatkar) – 17th July, 1919 / 29th May, 2007 has composed songs for 27 Hindi films and 12 Marathi films. His contribution in Marathi NFS is also highly respected. Snehal Bhatkar’s maiden film as a music director was Rukamani Swayamvar, in 1946, jointly with Sudhir (Phadke). In the credits of the film, his name appears as Vasudev. His first film as a solo music director was Neel Kamal (1947) where his name appears as B Vasudev in the titles. This is also the debut film of Raj Kapoor and Madhubala. All songs lip-synched by Raj Kapoor in this film have B Vasudev’s playback voice. Songs of Mukesh are rendered by other characters on the screen in the film. This the debut film of Bharat Bhushan and Geeta Bali. In order to listen to Geeta Dutt under Snehal Bhatkar’s baton, we will take up one more song from this film. In 1950, Shobhna Samarth took up her first production and directorial venture, Hamari Ladki. Probably, that prompted Snehal Bhatkar to switch his identity too. He now adopted Snehal Bhatkar as his new pseudonym. ‘Snehal’ in this name was prompted by the name of her new born daughter, Snehlata. Shobhna Samarth not only launched her older daughter Nutan with this film, she also introduced her younger daughter Tanuja as a ‘baby’ in the film. Nutan herself sings her first song on both sides of the screen. It is so very well known that Nutan did sing for herself again in Chhabili (1960). This was also produced and directed by Shobhna Samarth and had Tanuja in side main role along with Nutan in the lead. Her songs Aye Mere Humsafar and Laheron Pe Lahar (with Hemant Kumar), Yaaron Kisi Na Kehna (with Geeta Dutt) or Mila Le Haath (with Sudha Malhotra) are remembered even today. Nutan also gave voice to her own songs in a 1983 film Mayuri, for which she also penned the lyrics as well. Kanu Roy had composed these songs. The film has had set up Lata Mangeshkar’s strong connection with Snehal Bhatkar. Rut Basant Ki Mad Bhari Phulo Ka Saringa, Aaja Mere Bhawara Kaliyan Kare pukar, Chaloge Kya Chaloge Kya Sang Mere Saath – Bhola Shankar (1951) – Rajkumari – Lyrics: Bharat VyasThe film has two each of Lata Mangeshkar’ s and Rajkumari’s solo songs. I have picked up one of Rajkumari’s playful solo song. Snehal Bhatkar has also sang a duet and two triplets in the film. However, soft links of these songs do not seem to be available. Snehal Bhatkar did have one film – Gunaah – in 1953. Of the songs composed by Snehal Bhtakar, the songs available on YT are of Lata Mangeshkar. So, in order to get as many more singers to listen to under Snehal Bhatkar’s baton, we will take up his three films in 1955 and one in 1956. This is Leela Chitnis’s maiden production – direction venture. The song is a rare Talat Mahmood song, which has been covered up in the dusts of oblivions. Anwar Hussain is the son of second marriage of Jaddanbai – with Irshaad Meer Khan, and thus step brother of Nargis, who was the offspring of Jaddanbai’s third marriage – this time with Mohan Babu. In the present song, Asha Bhosale plays back for Azuri – a celebrated dancer of her time – and Anwar Hussain sings the song for himself more as a side kick. When a music director has not succeeded on the box office, he gets more of B or C grade films. These films do not have budgets that neither can support famous singers nor can make room for these songs in their packed schedules. As a result, the music director has to up his creative talent and try out relatively not so successful singers. However, in the retrospect now, we as listeners are gainers. We now have a totally different, very light and apparently frivolous song, wherein we see Snehal Bhatkar in quite a new light. The playback singer for the songs is identified. As can be seen in the notes to video clip, on screen, we see three children. The elder male child is Ashok Sharma (son of Kidar Sharma). The female child is Preetibala, who later came into mainstream Hindi films as Zeb Rehman. The younger male child is Dubey. Before we conclude today’s episode, we will take up the maiden solo song of Mahendra Kapoor. It is matter of well-settled records that Mahendra Kapoor’s maiden song in Hindi Films was Kisi Ke Zulm Ki Tasveer, a duet composed by V Balsara for Madmast (1953). D. Indorewala accopanied Mahendra Kapoor in that song. The present song goes in the records as a maiden solo song of Mahendra Kapoor. Welcome to September 2013 edition of Carnival of Blogs on Golden Era of Hindi Film Music. As usual, we commence our blog festival with posts on Anniversaries. Asha Bhosle turns 80 this year. Dusted Off presented 10 different moods of Asha Bhosle in Asha in Ten Moods. Songs of Yore continues with the series of S D Burman’s association with different playback singer in Asha Bhosle’s best songs by SD Burman. And here are some of the other articles on Asha Bhosle, which I ‘searched’ while looking for some more of the celebration articles. Zee News presents an interesting slideshow – Asha Bhosle`s songs through the decades, taking you on a journey with her through her decades in Bollywood and more. And HarveyPam’s Mohan Ki Asha, and very rich comments thereto, is a great post on Madan Mohan’s Asha Bhosle songs. Songs of Yore has paid a very unique tribute to Mukesh, on his anniversary on 27th August, through quite an impartial discussion on “why did SD Burman use him so sparingly” in Mukesh’s best songs by SD Burman . Shri Arunkumar Deshmuks reveals, in Comment #1, that Mukesh- S D Burman combination output was (just) 12 songs (only). Shri N Venkatraman, in Comment#19, fills up the two remaining songs. Vithalbhai Patel, who contributed several earthy songs in late 1970s, also passed away on 7th September. Here is list of his Hindi Films songs, as a token of our tribute to the departed soul. Biren Kothari, Pallete, has paid an objectively passionate tribute to Vithalbhai Patel in the article (in Gujarati) ગીતકાર વિઠ્ઠલભાઈ પટેલની વિદાય: પ્યાર મેં સૌદા નહીં. We have an unfortunate situation, where we are to pay homage to Madhubala Zaveri, on her taking up that long, fateful journey on 11-09-2013. Biren Kothari has penned મધુબાલા ઝવેરીનો સ્વરવિલય and placed video clips of some of her songs. Vijay Bavdekar digs the equation of S D Burman and Mohammad Rafi deeper in Maestro SDBurman, Evergreen Dev Anand & All Time Great Rafi Sahab & Hidden Truths. Here are the high points – the lips movement and expressions given on face by Dev Anand, perfectly matches the Rafi’s throw of words / look back to the Golden Era of Hindi film music, you will find that other music directors kept Kishore away & preferred Rafi for Dev Anand / One interesting thing is that Rafi was Burmanda’s first choice for other Heros / Look at the ”Trend setter-Singer ” equations,”Dilip-Rafi, Dev-Kishore and Raj-Mukesh”. Rafi sang most of the songs for Dilip Kumar, Rafi has an almost equal share with Kishore for Dev Anand and off course Mukesh sang major number of songs for Raj Kapoor, but Rafi also gave playback to Raj Kapoor for 31 songs. ‘Dances on the Footpath’ has presented A Song Performed By Carmen Miranda and Vasunthara Devi aka Vyjayanthimala’s Mother. The two songs, one Vasunthara performs is “ayyayyo-vasuntharadevi-mangammasabatham 1941” and the one by from which the song is inspired is “That Night In Rio (1941) – Carmen Miranda – “I, Yi, Yi, Yi, Yi (I Like You Very Much)“. “Dances On The Footpath” also has designed a very rich YT channel LifeIsaTrain‘s which has Classical Indian dancing feet / Noor Jehan / Kumari Kamala Lakshman and Recent uploads sub-chapters awaiting to be explored. The discussions on S D Burman and Vyjayantimala , in this edition as well as in the last edition of Blog Festival spurred me to visit “100 Years Of Bollywood” – an excellent channel on YT an return with S.D Burman- The King Of Melody and Vyjayanthimala – The First Female Superstar Of Bollywood respectively. I would also like to document the finds, Music Maestros Part-1 and Music Maestros Part-2. My friend Samir Dholakia had forwarded a message form his friend about another YT channel: Portrait of Director – This is a series directed by veteran film-maker Ramesh Sharma for Doordarshan and it captures the various aspects of film-making of master directors like Mrinal Sen, Ritwik Ghatak, Manmohan Desai, Shyam Benegal, Raj Kapoor and Bimal Roy. We would, now onwards, share at least one of the clips from both these channels to bring them on same page here. Songs of Yore has presented Best songs of 1953: Wrap Up 2. Undoubtedly a very difficult job of doing a putting in ‘other’ female singers in the most relevant and respectful consideration in an otherwise Lata Mangeshkar dominated category. As we had decided last time, we will take a look at all the ‘wrap-up’s together, in more details – may be as a full-fledged separate post. It is heartening to note that we are able to expand our catchment sources for information to be shared. However, there must be much more that remains to be explored and shared…….